Be it skinny, boyfriend, flared or cropped, ripped jeans is one denim trend that is still going strong. Whether you pair it with a floaty blouse and sneakers for a daytime look, or a silky camisole and killer heels for a night out in town, ripped jeans add a definite edge to your outfit. They are typically part of a casual look, but there are also ways to elevate your ripped jeans and make them a legit part of formal wear. A luxuriously textured coat can take your denim places. 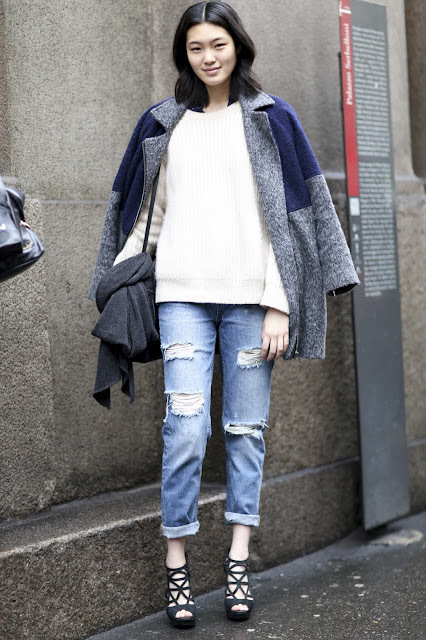 Play up the contrast between laidback and businesslike by pairing your knits with some ripped denim. Knits can add a cosier touch to your look, but you can easily dial up the glamour with a pair of strappy stilettos. Bell sleeves are having a huge moment these days. Whether you love them or loathe them, there’s no denying that they bring loads of drama to your look. With sleeves that attention-grabbing, keep the rest of your outfit chill — understated ballet flats are a dainty touch to balance off the slouchiness of your jeans. Need some daytime flair? If bell sleeves are too ballsy for you, try a sequinned or metallic top to get that midday glow. To avoid looking like a disco ball, keep all else neutral or casual. A slouchy metallic top perfectly straddles the line between dressy and insouciant. You literally cannot go wrong with a leather jacket. Ripped jeans, leather jacket, and a plain white tank top are the perfect combo, especially if you’re a fan of the model-off-duty look. Finish off with sneakers if you’re going to be out and about, or boots for extra tough-girl chicness. There’s nothing more spring-ready than a crisp Oxford shirt paired with white jeans. Ripped jeans rolled up at the ankles allow you to flaunt your favourite sneakers or heels (we are totally lusting over those Tiffany-blue Mary-Janes that fashionista is sporting below!). 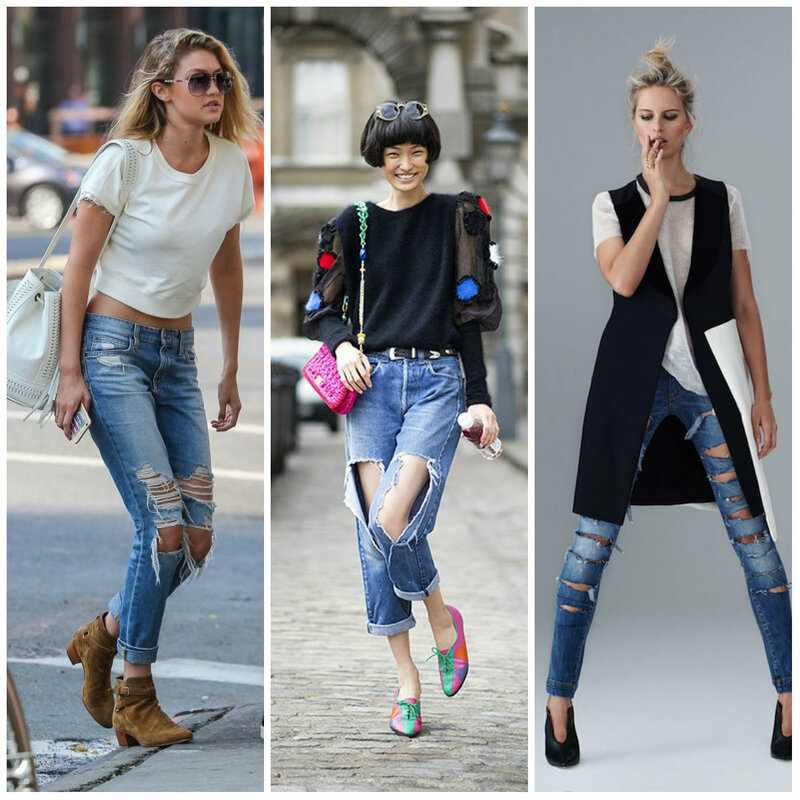 What are some of your favourite ways to wear ripped jeans? Share your style tips with us in the Comments section below!